Ridge Runner Abalone Assassin Assisted Opening Pocket Knife | BUDK.com - Knives & Swords At The Lowest Prices! 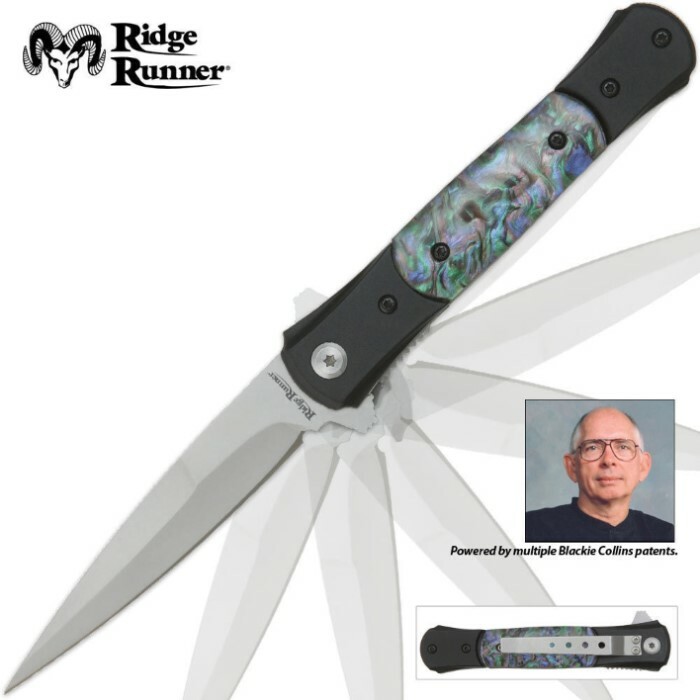 Reminiscent of the classic knives of the 1950s gangsters, the narrow shape of this Ridge Runner Abalone Assassin stiletto allows the 4" 420 stainless steel blade to penetrate deeply. The one-handed, assisted-open mechanism allows the blade to open with lightning speed with the help of a blade spur. Looks great so far. Sharp right out of box. 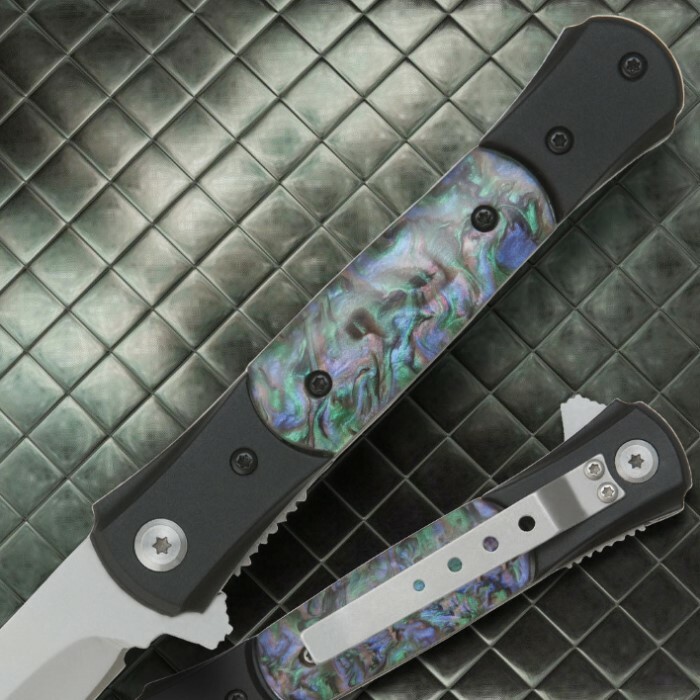 Abalone handle looks great. Great stilleto blade. Plan on carrying it EDC so, I will have to see how it holds up. Only thing so far stopping it from getting 5 stars, is the pocket clip is upside down for fast deployment. Nice easy blade flick extraction, very pointed end for sure entry, but other reviewer right: pocket clip on wrong side for fastest blade advacement. Blade is slim and good knife for fisherman to flay. This knife seems to have the same problem as all "Ridge RunnerN house brand knives. Out of the box it is dull, dull, dull! The edge angle on my example is wildly obtuse -- 80 degrees! It is like the edge is decorative, like a butter knife. I gave up trying to hand-sharpen it as it threatened to wear out a diamond stone before I got it whittled down to a reasonable angle, so I had to take my belt grinder to it (and discovered that there is a less-than-40 degreee angle of interference between the spine and the edge area, and marred the finish... oops). The action is nice and makes a very satisfying sound when opening. Blade wiggle was evident, but oiling and adjusting the pivot screw eliminated most of it. Also, the pivot hole is drilled crooked on mine so the blade touches one of the liners when closed... It's a fun toy, but not a serious piece of equipment. I hate to say it about budk but in this case I got what I paid for, a little less actually. The overall design was good but the blade didn't hold an edge well, didn't sharpen well, and the abalone on my handle was a little loose and bulged out, but still OK, it didn't cost much. Just received this knife yesterday and I love it, It's totally solid, perfect size and the blade is super sharp after hitting it with my sharpener a bit. The Abalone is really cool too. Perfect for the ninja on the go! I would buy this again! It would also make a great gift.